Adarsh Sein Anand was born on 1 November 1936. 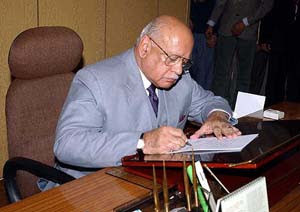 He was the 29th Chief Justice of India, and held office for more than 3 years, from 10 October 1998 to 31 October 2001. Justice Anand started his studies in Jammu, and then enrolled in Lucknow University. Later, he attended the University College of London, and enrolled as an Advocate at the Bar Council on 9 November 1964. Upon his return to India, he practised Criminal Law, Constitutional Law, Election Law at the Punjab and Haryana High Court. Later, he was appointed as Additional Judge, Jammu and Kashmir High Court from 26 May 1975. He became the Chief Justice of Jammu and Kashmir High Court on 11 May 1985. He was transferred to the Madras High Court on 1 November 1989. On 18 November 1991, he was appointed a Judge of the Supreme Court of India. He was the second longest serving Chief Justice of India, after Justice Y. V. Chandrachud. Some of his landmark judgements are often quoted, which reflect his commitment to human rights and justice. (i) In the Nilabeti Behera case (1993), his judgment on the right of compensation in the cases of custodial deaths is hailed as a significant contribution to the protection of human rights, as enshrined under Article 21 of the Constitution. (ii) In the D.K. Basu case (1996), he laid down important safeguards against custodial torture, which help in protecting the rights of prisoners. (iii) In the V.C. Mishra case, where earlier the Supreme Court had sentenced the Chairman of the Bar Council of India, V. C. Mishra, for contempt of court and suspended him from practising. A Bench headed by Justice Anand ruled that the Supreme Court did not have the power to debar any advocate from practising, even if he was guilty of contempt. Post-retirement he was appointed as the Chairperson of the National Human Rights Commission on 17 February 2003. He continued in this post till April 2007. Later, in February 2010, he was appointed as chairman of a five-member committee set up to examine the safety aspects of the Mullaperiyar Dam in Kerala. The committee submitted its report in April 2012. Anand was unanimously elected President of the International Institute of Human Rights Society in 1996. Same year he was awarded the Degree of LL.D. (Honoris Causa) by Lucknow University. In 1997, he became the first Indian to be awarded the Fellowship of University College London. In July 1997, he was nominated as the Executive Chairman of the National Legal Services Authority, a statutory body, for his contribution to legal aid for the poor. In 1998, he was unanimously elected as Honorary Bencher of the Hon’ble Society of Inner Temple, London. In 1999, he was awarded Degree of D. Litt. (Honoris Causa) by Jammu University. In 2000, he was awarded Honorary Fellowship for Life by the Society for Advanced Legal Studies, London. In 2001, he was awarded Degree of LL.D. (Honoris Causa) by Punjab University. He was awarded ‘Shiromani Award – 2002’ for Outstanding Achievements in the Field of Judiciary and Commitment to National Progress and Human Welfare. In 2003, he was awarded Degree of LL.D. (Honoris Causa) by Banaras Hindu University. In 2004, he was the recipient of Plaque of Honour from the University of Lucknow for outstanding contribution to the Country and Society. Awarded ‘Dogra Ratan’ Award instituted by Council for Promotion of Dogri Language, Culture & History, Jammu; in 2006. In 2007, was awarded National Law Day award by the President of India for ‘Outstanding contribution to fair and efficient administration of justice’. On 26 January 2008, Justice Anand was honoured with the Padma Vibhushan, the second highest civilian award by the Government of India. He is the author of the book, The Constitution of Jammu and Kashmir – Its Development and Comments. Judges like Justice Anand demonstrate how Judiciary is the third pillar of democracy. His judgements have strengthened the common man’s faith in the judiciary.